Baby bibs are wonderful pieces of baby clothing that protect the baby’s adorable outfits from all kinds of things from food to drool to formula. There are tons of different bibs on the market in all different kinds of styles, sizes and designs. We looked at 20 of the most popular baby bibs on the market and considered them for design, size choices, colors, absorbency, materials used, cost, how many bibs come in a pack, customer feedback and brand reputation. These three products reviewed below came out well above the rest of the choices we looked at. Any one of these would provide protection for your baby’s clothing and they’ll look cute too. Chances are you will purchase a lot of bibs while your baby is young. Most parents will use a baby bib until their little ones are toddlers. It is a great way to keep the baby’s clothing clean. You want to make sure that the bibs you purchase fit well. You want them to be snug but not too tight. There are many things that you will want to look at and consider while you are searching for just the right bibs for your little one. 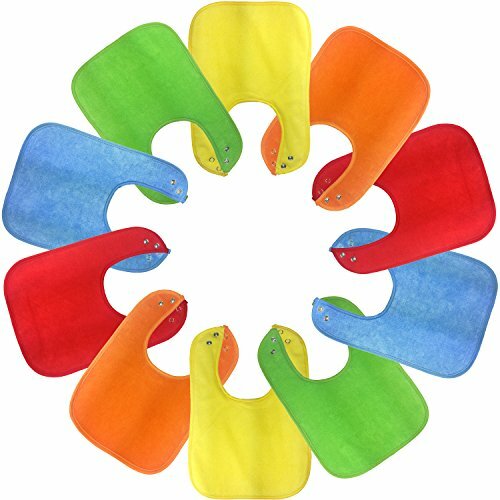 This pack of 10 brightly colored bibs are waterproof and have convenient snaps that keep the bibs in place for meal times and other times you want your baby’s clothing protected. The inner layer is 100% waterproof and encased between the two outer layers which are made of absorbent material that is soft to the touch. The snaps that keep this bib on securely have 3 different positions to accommodate your growing baby. They have a strong grip that the baby won’t be able to undo if they try to pull the bib off. 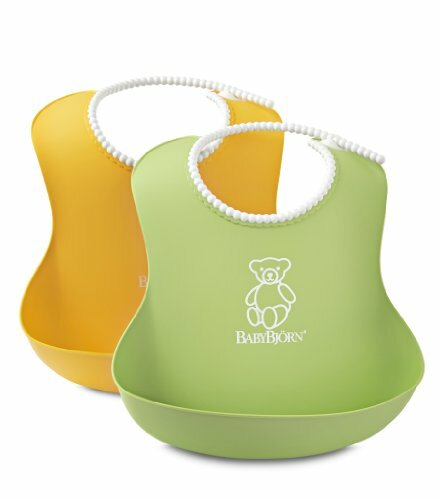 These bibs are a good size and will protect your baby’s clothing, even if they are drooling all day long. Maxy Moo Moo baby bibs come with a lifetime guarantee that states if you are unhappy with them for any reason, even several months from the time you purchase them, you will get your money back. They come in a gift box that makes them perfect for a baby shower gift. There are several reasons to purchase these soft bibs by BABYBJORN. This pack is for little boy babies with its adorable designs. The 2 snap closures offer parents two different sizing options that will fit your baby for awhile, even as they grow. The super cool design of the bib accessorizes your baby’s outfit perfectly while still protecting it from getting dirty. Your baby will look very trendy and stylish with these adorable style bibs. These are the perfect bibs for drooling, teething and mealtimes and it protects against spit ups too. Elastomer. They are machine washable. Another adorable bib set that will protect your baby’s outfits while they look adorable. They will help to keep your baby dry during teething and you won’t have to change their shirt or onesie. This will save on laundry as well. There are three adorable bibs that are decorated with playful and sweet patterns. Included in this set is a arrow bib, a quill bib and a feather bib. The bibs are made from polyester for the maximum absorbency. It will lock away moisture from spit ups, drooling and small spills so it doesn’t touch your baby. You don’t have to worry about uncomfortable crinkly bibs that have plastic linings. 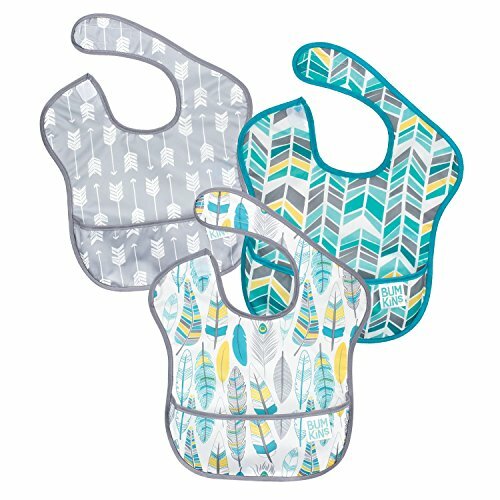 This three-pack of bibs will fit babies from 6 months up to 24 months of age with the triple snaps that allow for plenty of adjustability. Each bib measures 10” x 9” and covers plenty of the baby’s outfit. Cleanup is easy, just toss the baby bibs into the washing machine and they’ll come out good as new. They can be dried in the dryer as well. This three pack makes an adorable gift for a baby shower or use it for your own baby. Babies typically make quite a mess at meal times. Having a good quality bib that is big enough to cover the outfit underneath is a good way to save the look of the clothing. With so many different choices, you want to take your time to find exactly what you are looking for. All three of the top rated choices featured above are excellent choices for baby bibs that will protect their clothing from drool and other things that can ruin outfits and make them uncomfortable with the wetness drooling and spit ups can cause. You can never have enough bibs really, and they are much easier to toss in the wash and clean rather than piling up tons of outfits. With bright, bold designs, bright colors or adorable farm animals, you can choose one or even all three to make sure that you have plenty of adorable bibs on hand to protect your baby’s outfits. The buyer’s guide below contains more information on how to choose the right bibs for your baby. With this information you will be able to sort through the large number of choices available with confidence so you can make the right decision. There are several things that you will want to look for when you are searching for the right baby bib. We have listed these below. Look for bibs that are comfortable, practical, stylish and safe as well. Snap closure bibs are the best due to the ease of use and stability. Velcro can scratch the baby, lose the stickiness and is also hard to keep clean. Snaps are easy to use and the baby can’t pull them off. The purpose of a baby bib is to absorb wetness and protect the baby’s clothing from food and drink spills, spit up and drool. To do this properly, they need to be super absorbent. Look for absorbent materials such as cotton, polyester fleece, terry cloth and other absorbent materials. The bibs with the plastic linings are uncomfortable, hold heat in and don’t work as well as the ones with fleece lining. Bibs will usually last a long time when taken care of properly. Do not use dry cleaning only bibs as they will be very expensive to keep clean. Most bibs are not dry clean only but some of the super high end ones could be depending on the type of fabric used. There are several different types of materials that a baby bib will be made of. This includes cloth bibs that are able to be washed in the washer, wipe off bibs that have a special coating on them that wipes off easily. Wipe off bibs can still be machine washed, but it is better to not dry them in the dryer. Lastly there are plastic bibs that are molded and designed to hold dropped food during mealtimes. These rinse off easily in the sink and should be washed and dried thoroughly after uses. You don’t want to use a bib that is difficult to keep around your baby’s neck safely. Tie bibs can come undone easily and Velcro loses its stickiness. The snap closure bibs are the most practical and best to use for many reasons but the ability of the bib to stay on is very important. Drool Bibs – Smaller bibs will work just fine for the most part until your baby starts eating baby food. These bibs are typically much smaller than meal time bibs and work well to keep the baby’s front and under their neck dry. They are made of cloth and usually have some kind of waterproof backing though some are just fabric on both sides. Standard Bibs – This regular bib can vary in size and will usually protect the baby’s outfit from their neck to their tummies. During mealtimes this is a great bib to have on your baby so drips and messes don’t stain or ruin the baby’s clothing. Smock Bibs – This type of bib protects the baby in front, the sides and even the sleeves. Depending on the style, it may pull over the baby’s head or you will slip their arms through the sleeves in front and then snap in the back. If the baby or toddler is old enough, smock style bibs can be used as art smocks too. Plastic, Molded Bibs – These bibs are meant to be worn during mealtimes but due to the rigidity, they are not comfortable any other time. This type of bib stays in place easily and provides plenty of coverage. Molded, plastic bibs can be rinsed off super easy. Disposable Bibs – Disposable bibs are very convenient and are terrific for traveling and eating out at restaurants. They are not meant to be worn all the time and are for mealtimes rather than being used to protect from drool and other things that can mess up the baby’s outfit or have them uncomfortably damp. You want to make sure that the bibs you purchase for your baby are easy to clean. There is no doubt that your baby’s bib will get extremely messy during mealtimes, and even other times as well. They will definitely need to be washed. Depending on the type of bib it is, that will determine what type of cleaning it will require. Follow the cleaning instructions for different bibs that come on the package they come in. Bibs will usually get clean through one of three methods: wiping them down, tossing them into the washing machine or even putting them in the dishwasher (the plastic, molded varieties are dishwasher safe. You want the bib to fit well and be comfortable for the baby so they won’t mind wearing it. You want it to be snug but not tight and uncomfortable. Snug fitting bibs protect underneath the chin and neck area better and prevent food and liquid from getting into the neck creases of the baby. If your baby has a bib on that is uncomfortable they will be very upset and irritable at mealtimes or any other time they are wearing the bibs. If they are too uncomfortable they will become focused on simply getting the bib off no matter what. There are three common reasons that babies are not comfortable with the bib on. The bib is too tight – You want to ensure that the bib you use on your baby is not too tight. Cutting into the skin uncomfortably will just make the baby irritable and more than likely they will not want to eat. Hard ties or Velcro at the neck – The most comfortable neckline a bib can have is with the snap closures. They don’t scratch, come undone or otherwise cause problems. Material isn’t soft – plastic bibs may sound convenient but they are terrible for the babies in terms of comfort. They hold heat in, have no give to them and are not comfortable at all. The same can be said for plastic backed bibs as well which can be crinkly and annoying to the baby. Bibs are a crucial piece of clothing for your baby that will protect their outfits from food, drink, spit up, and drool. They come in a large variety of colors, designs, sizes and materials. There are so many choices available that it may be very difficult to choose the right ones for your baby’s needs. The information in this buyer’s guide is designed to provide you with all the things you should look for and consider when you are searching for the right baby bibs for your baby. Having all the information you need can help you make the right decision and provide your baby with comfortable, stylish baby bibs that will protect their clothing.